To create and deliver an uplifting and inspiring element to the event which otherwise comprised two hours of prominent speakers talking to the audience. The audience takes the threat of climate change very seriously and would not want the issue unduly trivialised with humour. The format was very long: 2+ hours of sitting without a break, nor the chance to ask questions. As the event was the launch of the journey into the “Transition Decade”, David created a concept based around the metaphor of 'Travel'. A mock Travel company ‘T10 Travel’ was set up comprising a crew of ex-flight attendants. By making the characters and the parody larger than life, T10 Travel was able to gain credibility and wide appeal with the audience. A presence was created before, during and after the event, building a solid story that was weaved throughout. "Welcome to the first leg of your journey into the Transition Decade.. all aboard if you want to join us... we’re here for the long haul!" Zero carbon emissions - thanks to our unique ‘Carbon Capture Breathing Masks’. Passenger participation - you help us generate new ideas to be green and clean. Emergency is an opportunity - there are no emergency exits! Happiness and Joy - We’re pretty cheesy...check out our outfits! David played the role of Chief Flight Attendant 'Doug' with two cabin crew: 'Skye Blue' and 'Astral Travel'. In addition three musicians played in the foyer before the event. A T10 Travel bureau was set up in the foyer. 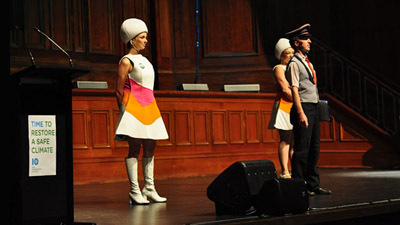 The band played ‘happy, escapist vacation music’ as the crew roved amongst the audience promoting T10 Travel, showing brochures of the Transition Decade (a sustainable future). Early in the event, the crew ran a spoof of a safety demo on stage. . . "please fasten your sense of humour safely around your hips. Sense of humour must be worn at all times in the Transition Decade". . In the absence of an interval, the audience were given the chance to stand up and stretch via an "in-flight announcement". This was delivered by David (as the Captain) with the Cabin Crew directing people from the stage. Towards the end of the event, T10 Travel performed an 'Emergency Procedure' that involved audience participation. Participants were asked to discuss ideas about how to avoid climate emergency with their neighbours. The Cabin Crew then demonstrated new 'Emergency Brace Positions' based on their ideas. . . all good fun! Flight crew in the foyer to thank people for flying T10 airways. T he audience reaction to T10 Travel was overwhelmingly positive. Many commented that it gave the event a much needed light relief. Others commented that it had helped inspire them to seek fun and creative means to continue campaigning for faster response to Climate Change. In employing Dave as our creative coordinator for the Transition Decade launch event, we couldn't have found someone more suitable to the job. We have had much positive feedback from those that attended and in particular for his contribution. He always brings to a team a level of understanding of the issues as well unique lateral thinking to how to communicate messages. What impressed me the most he was able to deliver "T10 Travel" in such as way that it didn't just seem like entertainment to the crowd, rather, humour and having some fun along the way was seen as an important aspect of the transition strategy. The above concept was developed over 4 weeks involving 3 client meetings to fine-tune the material to suit the tone and pitch of the event. David co-creates with the client and other artists when required. Looking for something 'out of the box' at your next event? Contact David now to see how he could customise comedy for your next event with some fresh ideas.